As we reported in January, Robert Culp wants the LA Zoo&apos;s current elephant enclosure shut down and all construction on the new enclosure halted, due to alleged pachyderm cruelty. Yesterday, the judge&apos;s ruling in the case was made public and he issued a big "no." "This is a ... public policy dispute between the plaintiffs and the defendants on how to run the L.A. Zoo," Dunn stated. "Moreover, there does not seem to be any illegal activity currently ongoing that an injunction should be imposed to stop." Construction on the new exhibit has resumed and Billy, the lone elephant at the LA Zoo, will continue living in his current enclosure. It is unclear what Robert Culp&apos;s next move will be, but pachyderm lovers and animal activists can expect another battle soon. Plans for an elephant breeding program are still under way, yet there are agreed-upon strategies for how the new elephant families will be managed. 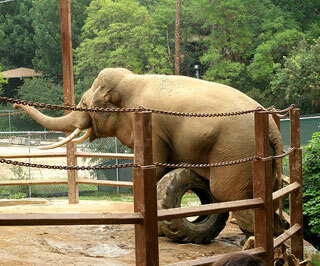 This controversial issue is sure to land activists and the LA Zoo back in court soon.